Happy New Year to everyone. I hope you had a lovely holiday. We waste so much time complaining about the superficial things that we miss precious seconds, hours, days, even years of our life. It’s like the Jewish prayer: “Days pass and years vanish and we walk sightless among miracles.” We must be grateful in the good times and the bad, for, in the end, it’s still life. Life is short. Life is sacred. And, because of that, it should be celebrated in the good times and the bad. It doesn’t matter where you find yourself: a long line at the DMV, the dentist chair or the chemo room, it’s still life and there is joy to be found in the simple taking of a breath. 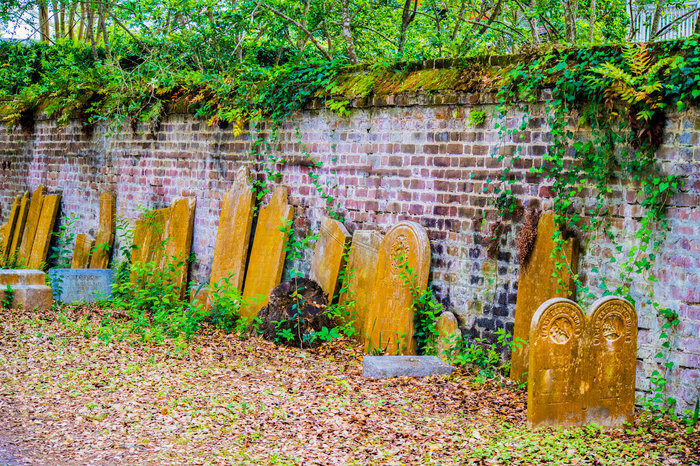 These decaying and misaligned tombstones give wittiness to the saints who have gone before us. Their souls are at peace. As we celebrate their lives, we reflect on all the good that they accomplished and how their influence continues today. All Saints’ Day was originated for this purpose by Pope Boniface IV in 609 AD on May 13. Pope Gregory, III changed the date to November 1 during the mid-eighth century. After the reformation Protestants retained the observance to honor those who died in the last year. We draw courage and strength remembering those whose lives we celebrate. Many demonstrated tremendous faith while enduring great hardships. No one can know the inner struggles of another person’s life, but we can know with certainty that they are triumphant over death. As we light a candle in honor of each of these, we light it in recognition that the light of her or his life will never be extinguished. Dear Holy Father, as we celebrate the lives of our loved ones who now abide with you, help us to lead our lives in such a way that we will illuminate the path that will lead others to you. Amen.